Misc Phoebe in natural light. She's been known to stop traffic, she doesn't mind the camera, she's one heck of a room mate. Phoebe is certainly a looker. I hope her need to stop traffic doesn't occur to often. These types of room mates are usually the best though I wish my roommate was more welcoming of the camera. That's a sweet shot with a great expression! I've been mad for pet shots recently, with three new animals in the house. It has a way of sucking all one's energy from other things... not a bad thing! Awww, what a cute looking dog. I really like the expression on the dogs face as it did make my chuckle when I saw it. 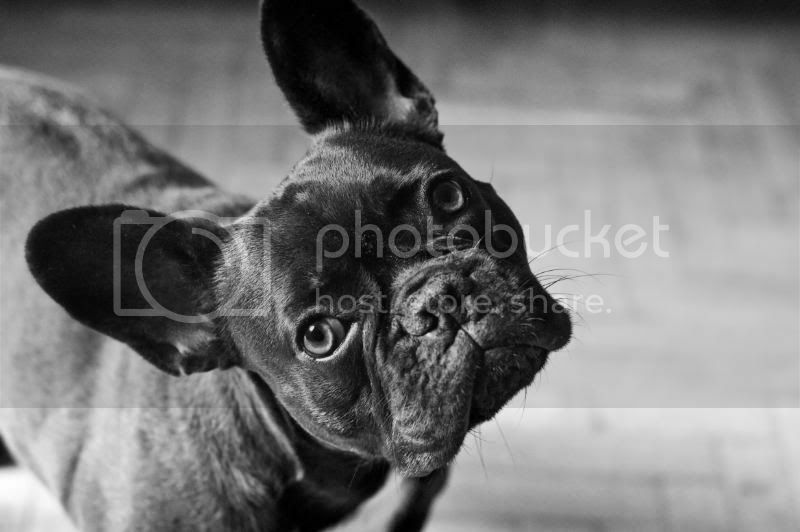 I also like the black and white treatment that you used here as it brings out alot of the texture on the dogs face. I totally turned my head sideways when I looked at this, that's how much I love it. Dog photos are my favorite subject, and you really did a great job on this one. I love it when people can get those funny and adorable angles that dogs sometimes will show you for the camera. Haha... how cute. He is adorable. Totally make me laugh when I see it. I think that picture would brighten anyone's day. You should sell it to Hallmark for a "Cheer Up" card! Mine runs away. Something about that scary one eyed creature he doesn't like.. The cat in my avatar is named Phoebe and I will bet she can lick your Phoebe in a skinny minute. That is one cute traffic-stopping dog though.